To help you revel even more in the final season, here’s a collection of residential, Game of Thrones worthy castles listed here in the U.S. Since it’s the eighth—and final—season, let’s make the most of it, shall we? Let’s think a little about our own ideal land holdings as we get the answers to questions like whether or not Daenerys Targaryen, aka Mother of Dragons, finally reclaim the Iron Throne with the help of Jon Snow. Or will Cersei Lannister maintain her claw hold on this seat of power by outconniving them all, And what’s the deal with that ice zombie dragon? If you’ve ever said to yourself, “man, I wish I could live in a castle,” I’d like to point out that it’s entirely possible! Game of Thrones worthy castles exist right here on U.S. soil, and while they might not be quite as majestic (or blood-drenched, thankfully) as Casterly Rock or the Red Keep, they’re still pretty darn posh. 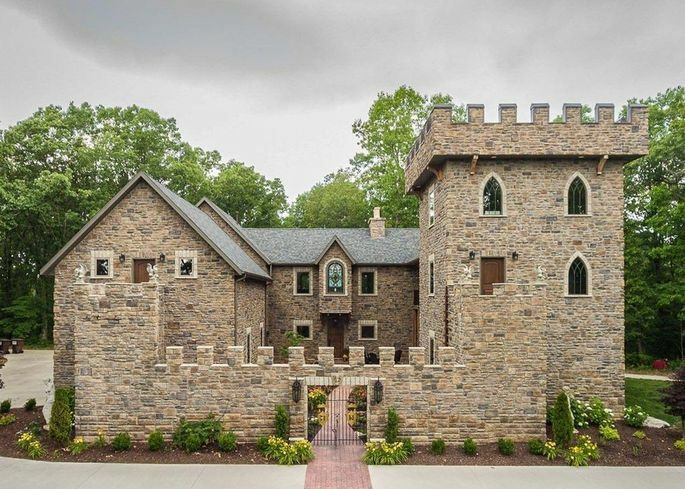 So in honor of of what some are calling the greatest TV show of all time, I’ve plundered Realtor.com’s listings to come up with the real-life regal residences, of Game of Thrones worthy castles you can actually buy—or fight for if that’s your thing. Why it gets my seven blessings: This castle may not be complete yet, but it comes with its own kingdom—242.5 acres, to be exact. And at just under a $1 million, it hardly costs a king’s ransom. Located on wooded land on the East Fork of the Little River, the property is also host to a spring-fed lake and waterfall. The castle itself was designed with 30 bedrooms,15 baths, and a dungeon (time to go dragon shopping). There’s also plenty of space for a grand ballroom, wedding chapel, banquet hall, and just about anything else your subjects could desire. Why it gets my seven blessings: Fit for a king and queen, this medieval castle–style home with a private gated entrance was built in 1952, but its interior has been updated to include every amenity to please even the pickiest members of the royal family: an indoor pool, grand gala accommodations for more than 60 people, and impeccably landscaped, 1.87-acre grounds. All this, and it’s appraised for over $2.6 million. Talk about a royal flush! Why it gets my seven blessings: Talk about the Many-Faced Home! Mayan meets medieval in Montana! 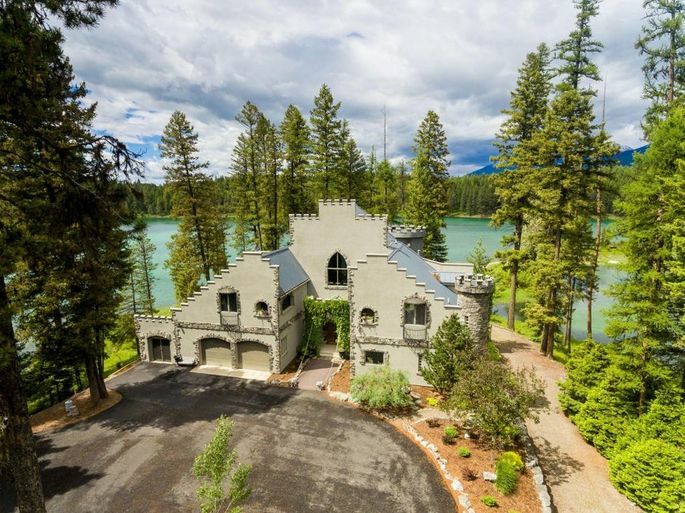 Known far and wide as the Castle on the Lake, this four-bedroom, four-bath home even has a faux drawbridge, and comes with over 15 acres—some of them lakefront. You’d never guess it was built as recently as 1998, with its two-story stone fireplace, secret passageways, and reclaimed wood beams overhead. While it appears to be in the middle of an enchanted forest, it’s actually not far from Kalispell, Glacier National Park, and the quaint resort town of Big Fork. Why it gets my seven blessings: Tapestries, suits of armor, thick stone walls, battlements—even gargoyles! Within its 4,922 square feet there are four bedrooms, seven bathrooms, and an unfinished dungeon (er, basement) that could be used as a wine cellar, storm shelter, or makeshift holding cell for misbehaving guests. And the property also has a private zip line for pulse-racing escapes. Why it gets my seven blessings: This home fit for country music royalty was built in 1967, but the five-bedroom, six-bath interior has been completely renovated so the entire royal family can be comfortably accommodated. 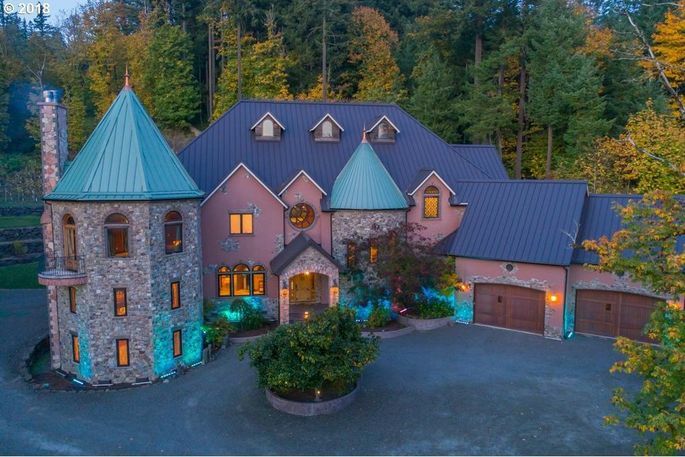 Nestled on 2.45 acres, the home has plenty of room for jousting. And of course there’s a full wet bar, perfect for Tyrion to knock back a few. 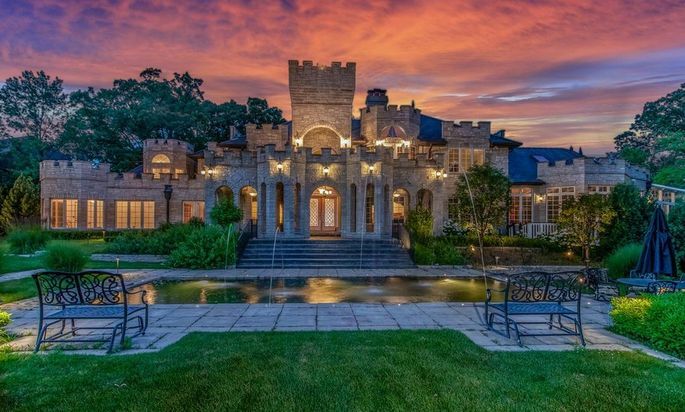 Why it gets my seven blessings: A one-of-a-kind Portland icon known as Blackberry Castle, this one has a royal courtyard to die for! It’s my fave. Click on the link above to see inside. It sits on six acres and has a vineyard and an underground wine cellar to store the libations wrought from the fruit of its own vines. Potential Rapunzel suitors will appreciate the fabulously equipped home gym with the climbing wall, and the princess in all of us will be well pleased with the two-story turret library, the European village–style atrium bar, and the home spa with sauna. 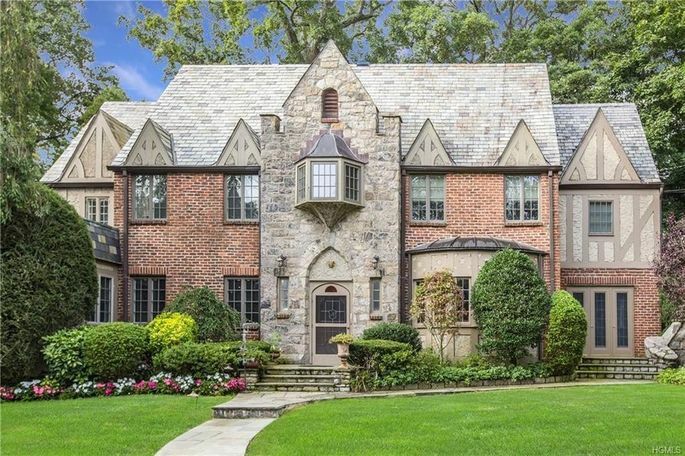 Why it gets my seven blessings: If everyone in Westeros weren’t so darn intent on vying for the Iron Throne, they could be perfectly content in this lovely Tudor, originally built in 1928 and completely updated inside and out. Stately flagstones add to its castle-like exterior, while a spacious new kitchen, a sparkling sunroom, and an enchanting master suite give the lord and lady of the manor some much-deserved pampering. Why it gets my seven blessings: Only in Florida will you find a terra-cotta-colored sandcastle right on the beach. It was custom-built by a prominent brewmaster, which could explain the six-pack motif, and the lighted copper dome over the circular bar that looks suspiciously like the top of an ale-brewing vat. As all the best castles are, this one is a bit of a landmark on Melbourne Beach. One of its more charming features is a rooftop deck from where you can stargaze and watch the flaming catapults fire, or rather the rockets launch, from Cape Canaveral. To read more about Game of Thrones worthy castles, see my feature on Realtor.com.